A wonderful telling of a story little known outside of the North Carolina Piedmont. Ms. Wagner’s ability to not only convey the history but also the methods of early gold mining to children helps make this book a must-have for young ones interested in history and geology alike. Wow! In school I learned that California’s Gold Rush of 1849 was our nation’s big gold rush. But this book turns history upside down! 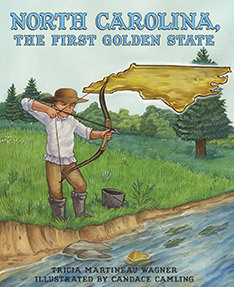 Gold was actually discovered in North Carolina fifty years earlier! This adorable children’s book tells all about a little boy who discovered gold on his farm in 1799 – and set off America’s first gold rush. More power to kids! I read this book to my son and he was mesmerized by the story. To think a young boy discovered gold while fishing in a creek and it started a gold rush! In fact, the United Sates government built a mint in Charlotte, North Carolina to coin all the gold discovered in the area. This book gives factual information about mining, which even I had not known before. A fun read! My daughter is into anything scientific and this well-written story held her interest. We live not too far from the Reed Gold Mine in North Carolina where the gold was discovered in 1799 – so we’re taking a road trip to mine for gold at the mine! I like how the author had a glossary of mining terms in the back of the book. Loved the two-page author note with additional information on the history of the mine. Great colorful illustrations make this an attractive book!